BLM Artist-in-Residence, Joe Colwell, at Carlson Vineyards! Join us on Saturday, September 8th from 2-5 pm at Carlson Vineyards to meet the BLM artist-in-residence, Joe Colwell. 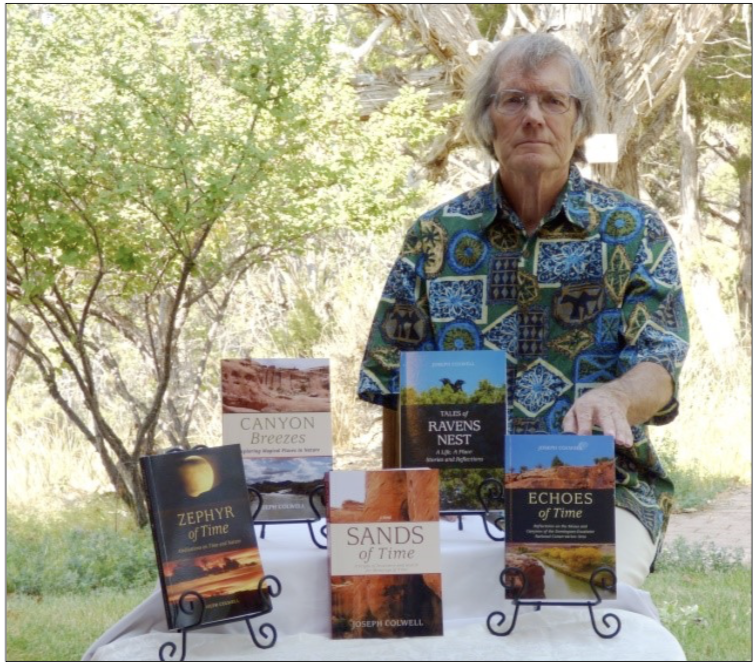 Joe is the author of the newly published book, Echoes of Time: Reflections on the Mesas and Canyons of the Dominguez-Escalante National Conservation Area, which is a collection of essays highlighting the scenery and serenity of the Dominguez-Escalante National Conservation Area! This is Colwell's newest and fifth book in his collection. The artist-in-residence program promotes awareness of the exceptional places protected within the BLM’s National Conservation Lands. Artists are inspired by and translate the natural and cultural resources of public lands. Local author Colwell was selected to share his experiences and promote public appreciation of the dramatic landscape of D-E NCA. One of Colwell’s goals while writing Echoes was to help people reconnect with nature and understand their relationship with natural places. Enjoy a glass of CCA's delicious new wine, Terra, while you have your copy signed by Joe! CCA is proud to announce the release of our new wine, Terra! This is the second year of wine that Carlson Vineyards has produced in collaboration with us. $2 of every bottle is donated to CCA's programs that get kids out into our National Conservation Areas. It is currently available for purchase in the Carlson Vineyards tasting room. Joseph Colwell of Hotchkiss, Colorado, thinks and writes about nature and the environment, mixed with his own philosophy and lifestyle. He believes we are losing touch with nature so he relays his environmental philosophy about the meanings of nature and our place in it in his writing. “We need to be aware of the life that surrounds us, the history of the land itself, and our responsibility to the future.” After a career as a land manager across the West with the U.S. Forest Service, Joseph and artist wife Katherine now own and operate Colwell Cedars Retreat on forty acres of juniper forest overlooking the North Fork Gunnison River in western Colorado. They teach art and nature related lifestyles. Click here to read the BLM press release about the book!